One of my most favorite rituals in the science of Ayurveda is definitely the practice of Abhyanga. Translated as “to oil” (abhya) and “limb” (anga), this nourishing self-oil application truly heals the body and soul from the outside in. In fact, Snehana, the Sanscrit word for oil, may also be translated to “love”. So according to Ayurveda, snehana, may be the application of oil, but it is also an amazing practice of self-love as well. 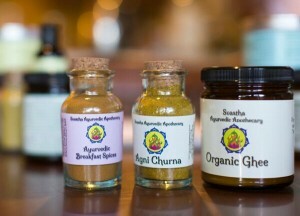 According to Ayurveda, Abhyanga is a major asset of one’s daily routine (dinacharya). Abhyanga is the application of warm, herb-infused oil to the entire body from head to toe. This is typically done by massaging each area of the body with the oil, while bringing great focus to any sensations that arise in the process. This oil massage may be given by a massage therapist that has been trained in the art of Abhyanga; however, to utilize this healing practice in one’s daily routine (dinacharya), you will most likely be applying this in the form of a self-oil massage. Applying this medicated, herb-infused oil to the body allows deep healing, as it moves from the physical body into the subtle. The multitude of benefits you will unveil is quite powerful and will be enhanced with the consistent practice of Abhyanga. Abhyanga is a mindful practice that should be done with patience, awareness and love. Abhyanga can be an essential part of the morning routine, but alternatively, can be incorporated in the evening before bedtime. Abhyanga ideally will include the entire body, from the scalp to the soles of the feet; however, this healing practice can also be done in a shortened version on the days/nights that time is limited (see below). Abhyanga is an evolving and changing practice to fit whatever you may need that particular day. Remember, it is better to utilize a quickened method and stay consistent, then to skip it when time is short. Like most areas of Ayurvedic healing, consistency is key! If the tongue has a heavy coating on it, this indicates an excessive amount of toxins in the body and Abhyanga should be discontinued until the tongue is clear!! Place about a half cup of the Abhyanga oil into a small sauce pan on low heat. Slightly warm the oil until it is just slightly warmer then body temperature (about 100-110 degrees). Make sure the oil is not too warm by carefully placing a finger into the oil (only if you are positive it is not too hot), and making sure your finger can withstand the oil temp for over 30 seconds. Once the oil is at a desired temp, place the oil in a small bowl. Take a small amount of the oil into the palm and begin to massage it into the scalp and forehead. NOTE: If you do not desire to wash the hair, you may skip the scalp on these days. Once you have thoroughly massaged the oil over these areas, begin to massage the face, jaw bone and around the ears. Focus on any area of tension. Move down to the neck and then to the shoulders. Continue to the arms, placing great focus on each muscle and joint. Move to the back with focus on the spine, trapezius muscles, shoulder blades, lower back and any areas of soreness and tension. After this, begin to massage the chest and then the stomach. Rub the stomach in a clockwise, circular motion to enhance digestion and stimulate the circulation. Continue to the gluteus muscles, applying deep pressure to relieve stored tension and release any obstruction. Work your way down the legs beginning with the groin, quadriceps, hamstrings and IT band. Massage over the knee area in a circular motion making sure to cover the front, back and sides. Move down to the shins and calves, massaging in a straight, downward motion. The feet are an important way to end the massage, as this really enhances the grounding effects of Abhyanga. Spend a couple minutes on each foot, if time allows. Make sure to focus on all areas including the ankle, top of the foot, heel, sole of the foot, ball of the foot, each toe and the area in between the toes. If it the Abhyanga is part of a morning routine, leave the oil on for a minimum of 30 minutes (if possible). Then take a warm shower and rinse the oil off with water only. If you use soap, this will dry out the skin and reduce the benefits of the oil. Dry off with an old towel, since some residual oil may be present. If the Abhyanga is part of a nighttime routine, you have a few options. One is that you can put on an old pair of pajama’s and socks and let the oil absorb throughout the night. I personally find this method the most powerful and effective; however, the messiest as well. Another option is to keep the oil on for a minimum of 30 minutes, and rinse off in a warm shower. The third is to take a warm bath after. This is also a very powerful method, as the heat of the bath water will open the pores and enhance the absorption of the medicated oil. ***I do not recommend wearing the oil throughout the day, since this will ruin your clothes, especially over time. Each day may require a different method. You can play around with these techniques and find which one is most beneficial for your needs. No matter the method, I do recommend incorporating Abhyanga into the day/night routine 3-7 days each week. Before I say goodbye, I will leave you with a nice technique on those days that you can only spare a few minutes. Believe it or not, this simple method is quite powerful all in itself! Warm the oil, as seen above, if time permits. If not, warm each oil application in the hands by rubbing them together briskly. Massage the scalp, the forehead, around the ears, jaw bone and neck. Try to give a bit of focus to each area, especially when tender spots are found. Move down to the feet and follow step #8 above. 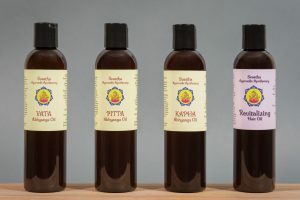 Discover our full line of Medicated Massage Oils! I don’t have warm shower at home… just cold water! Is there a problem? Why sould be warm water always? Thank you for writing in! If cold water is all you have then there is not much you can change about this. The reason we prefer the warm water is because cold water can be constricting and reduce circulation in the body. Further the cold quality increases Vata and can overstimulate the nervous system. Abhyanga is often used to reduce Vata and calm the nervous system and therefore the warm water shower is preferred after the oil application. Please let me know if you have any further questions!